The history of the cuñape is very interesting. 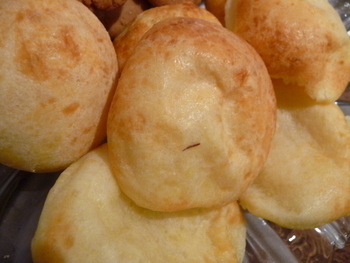 It is a Guaraní word that means "a woman's breast" because when they bake, they form a little peak in the center. To get this "peak" you must insert your thumb into the bottom of the ball creating a little hole before putting it downward on that hole on the baking pan for the oven. If you don't do this, the cuñape can end up looking very flat when you take it out of the oven. Since baking powder is traditionally not used in making these, this "hole" step is really important for the right shape. Crumble the cheese into a big mixing bowl (it should crumble easily) and add the yucca starch and egg and a pinch of salt. Knead it with your hands until you have a dough-like consistency. At this point, if it's too dry, you can add some milk or water. Make them into little balls and insert your thumb into the bottom to make a hole in the bottom (this helps create that peak I talked about above). Place them on top of a non stick pan or a floured pan. Let it sit for 15 minutes. Place them in the oven between 15-20 minutes. Do one batch first. If it comes out too cheesy, then add more starch. 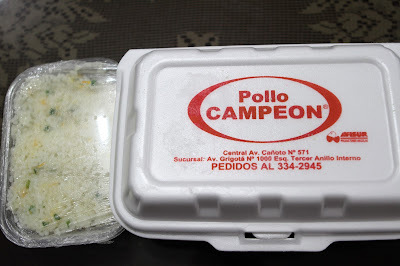 Rayar el queso, mezclar con el almidón de yuca y agregar el huevo batido. La consistencia debe ser blanda haga unas bolitas haciéndoles un pequeño hueco con el dedo por debajo y póngalas en una bandeja para hornear. Deje quince minutos. Ponga en horno caliente por 20 mins.